Plasma Media Center 1.2 Beta is here! We are happy to announce the 1.2 Beta release for Plasma Media Center (PMC). This release comes with nifty new features and an improved media experience for your device! Please follow instruction to install Plasma Media Center on your machine. Please try out Plasma Media Center and let us know what can be improved or added in order to make final release more cool and awesome! The first version of PMC had key navigation support in it, but it behaved weird at times. This was due to the way we were handling the different UI elements. This has now been changed to the standard PageStack way of putting UI pages on the current view, this made the keyboard navigation consistent. Unlike the other media modes in PMC, the All Music mode doesn’t share common components for browing music etc. For this reason, the keyboard navigation wasn’t able to take advantage of the common key bindings. Now, the All Music mode has its dedicated keyboard navigation workflow. The playlist used to show only the media name in the list and that was it. In 1.1, we show the media title, artist and duration for each item. You can now search for your favorite YouTube videos and watch them directly from your mediacenter. As a result of storing all the playlist information, the playlist populates faster. Please follow install to install Plasma Media Center on your machine. Thanks to PMC contributors Akshay, Shantanu and Sujith for helping in writing this blog post and making 1.1 beta release happen. Last week, I attended KDE Meetup held in DA-IICT college. It was much more better than what I expected. Everything went so well from start till end. I reached venue in morning around 9:30 am, registration was still going on. 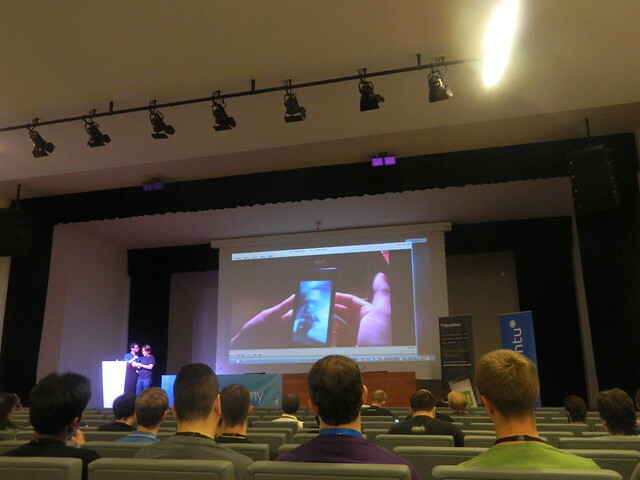 It was quite amazing to see more than 300 people who came to attend this KDE meetup. After opening ceremony, Pradeepto Bhattacharya gave talk on Introduction to KDE, where he spoke on why, how, who should contribute to KDE and other general KDE stuff. People were so interested and asked so many questions during his talk. Later, Vishesh Handa gave talk on Introduction to Qt. He talked about various features available in Qt and showed some demo too. Participants were so interactive that this session was extended till lunch break and we postponed next talk to tomorrow which was supposed to be given by Shantanu Tushar. Later, Vishesh Handa took one session on version control mainly git. People were so smart here too and asked so many questions. Post lunch, one more session was taken by Pradeepto Bhattacharya for around 50 people who came from Bardoli . These people were going back from conference due to some reasons like not able to follow first half day talk, hesitated in asking questions in crowd, language problem and many more reason. Pradeepto noticed and talked to all of them and tried to understand their problems. At the end, they promised to come tomorrow and we promised to take separate session for them in college lab. In evening we planned to celebrate KDE 4.10 release party 😀 Awesome cake was arranged by Yash Shah and volunteer. It was so kool celebrating release party together. I, Aditya Bhatt, Jigar Raisinghani, Yash Shah and some more (forgot name) of us went to lab to take sessions for Bardoli students. 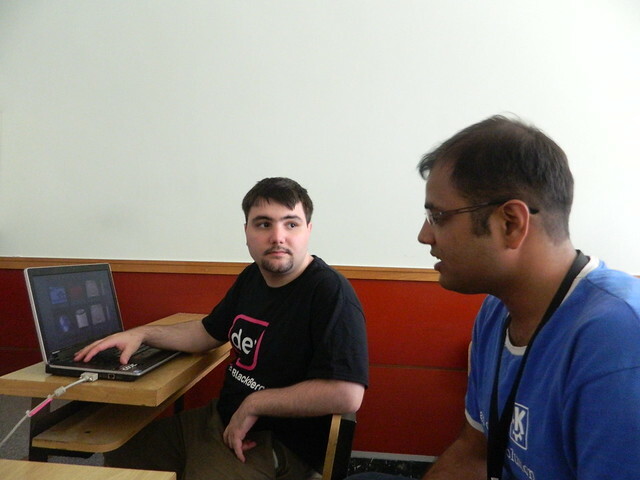 Aditya showed first kool KDE desktop and then yash talked his experience with KDE. All of them responded so well and asked questions without hesitating. 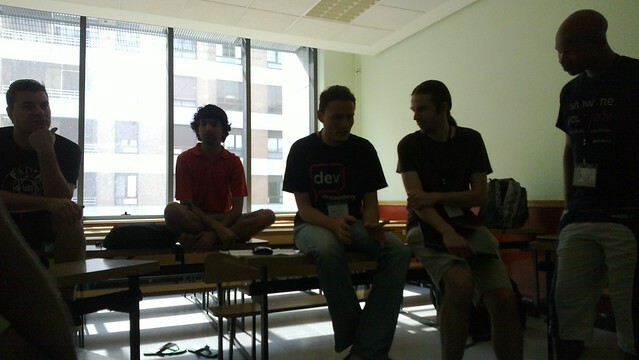 After making them comfortable with KDE, we demoed them how to make Qt apps and told them to do same too. At the end of this session, all of them were confident and inspired too. Parallel to this session, in Main Hall talk was going on Our Plasma workspaces – desktop, tablet etc by Shantanu Tushar , Contributing to KDE EduSuite by Rishab Arora and Understanding Nepomuk – Semantic Data by Vishesh Handa. Post lunch, there was Workshop on hacking on KDE apps (opted rekonq). Initially, we faced little problem due to slow internet connection, after sometime this issue was fixed. People learnt to compile and build rekonq source. They played around source code and done changes in code. This meetup was so awesome, we all had lot of fun helping them. 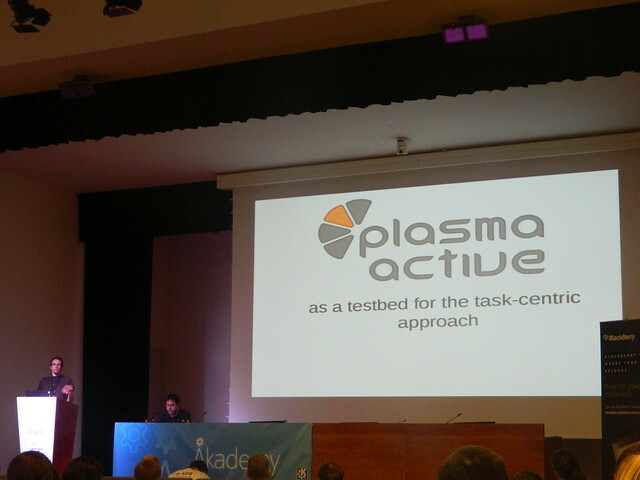 We were able to motivate and inspire so many people from this KDE meetup. Thanks to all who were there and participated actively in it.